Lines is a very popular, simple and easy-to-play puzzle game. 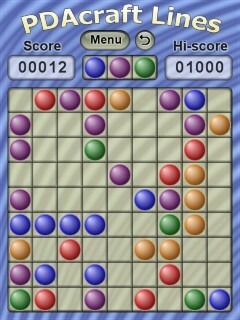 Each turn, three randomly colored balls appears on the board. You can move ball if there is a path (linked set of vertical and horizontal empty cells) between the current position of the ball and the desired position. You must move one of balls to pick the line of 5 or more balls of the same color. When such line is arranged it disappears. You can make vertical, horizontal or diagonal lines. Lines, which are longer than 5 balls, will be awarded by extra score points. The game is over, when the entire board is filled with balls. This game is cross-platform. You can run this application either on your PocketPC device or on your DesktopPC. Removal of mistakes and updating.